Take I-10 East to the Queen Creek Road exit; turn right toward the City of Maricopa (Hwy 347). Proceed south through the City of Maricopa. Before the railroad tracks, turn left on the Maricopa-Casa Grande Highway. 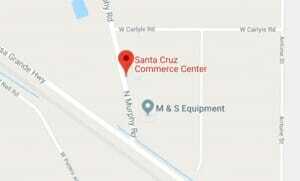 Go about 8 miles; Santa Cruz Commerce Center will be on your left. For leasing info, please call 520-568-3246.